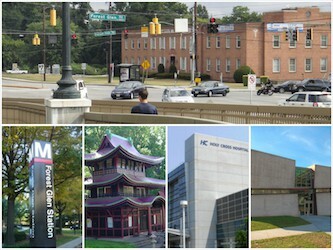 Our Forest Glen Station is Metro’s 81st busiest station (out of 91). That’s pretty low traffic with about 2,230 a day but a bit higher than the Arlington Cemetery’s 363 daily ridership! Traffic change at Georgia Ave. and Forest Glen Rd. After a substantial increase of traffic on Forest Glen Rd., the State Highway Administration (SHA) has removed the “Do not turn on RED” sign at the intersection of Forest Glen Rd. and Georgia Ave – only months after installing it. This sign has been replaced with a “Yield to Crossing Pedestrian” sign – so you can now take a right onto Georgia Ave. from Forest Glen Rd on a red light (after of course making sure that no one is crossing the street). The previous sign would cause traffic on Forest Glen Rd. during rush hour – often extending past the main metro entrance and blocking many intersections. We welcome the change and glad the State and Montgomery County are looking out for Forest Glen! Have a Local Street Sign in Need of Repair? Montgomery County DOT recently repaired the street sign at Forest Glen Road and Coleridge in about 2 weeks after the sign was reported as falling over. If you have a sign that is in need of repair email me at Findingforestglen@gmail.com and I’ll put you in touch with folks that can help! Do you live in the boundaries shown below? 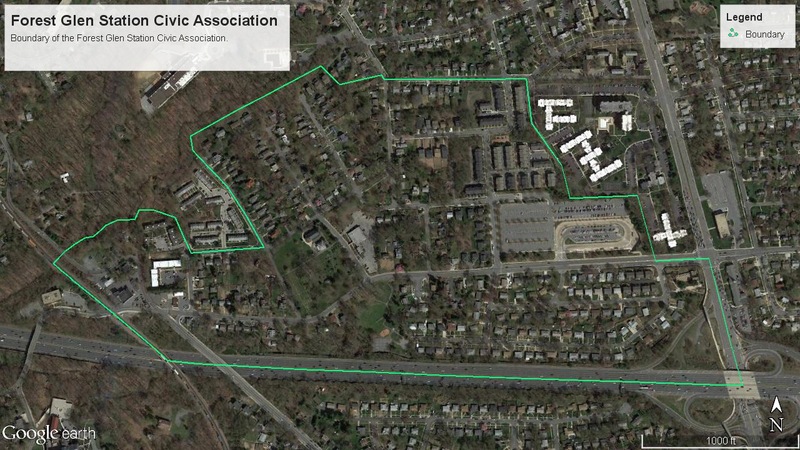 Join the NEW Forest Glen Station Civic Association today! Meeting details coming soon. You can learn more information here! Check out Silver Spring Inc.’s podcast on Silver Spring’s vibrant neighborhoods. This week the focus is on Four Corners, an area with a lot of history and one of the first art deco shopping centers in the area. Click here to listen to FFG’s contributor Sean Emerson talk about this interesting neighborhood. You can listen at 19:12 about our own Forest Glen project!